La Paillotte provides a relaxing and comfortable home-from-home, with the addition of a large private garden and a pool with exceptional views. This is a unique property which consists of two separate houses, either side of a private courtyard. You have the choice of renting both properties or just one. If you do rent only one house, the other will not be let while you are there. This will ensure that you have exclusive use of the garden and pool throughout your stay. If you wish to rent the second house, just let us know and we can provide a competitive price. It is perfect for either family or friends or family. Both houses are comfortable, fully equipped, child-friendly homes with a veranda plus a large wooden terrace from which to relax and enjoy Al-Fresco wining and dining with beautiful views. La Petite Paillotte has the added attraction of a well-equipped children’s play room. The large private garden is entirely enclosed as is the family sized swimming pool. The garden is truly a delight. Lovingly created by the owners, the peace and tranquility are evident. It is the ideal retreat where you can relax and enjoy the beautiful surroundings, assured that you also have everything to make your holiday that bit easier. There is very little passing traffic in the village but even so, the courtyard and gardens are private and enclosed, allowing children and dogs to play safely. That said, this is a perfect base from which to explore Burgundy or other nearby areas as transport links are so good. In addition, free WiFi internet and excellent mobile phone reception enable you to stay in touch with the outside world. We are Richard & Caroline WILLIAMS. 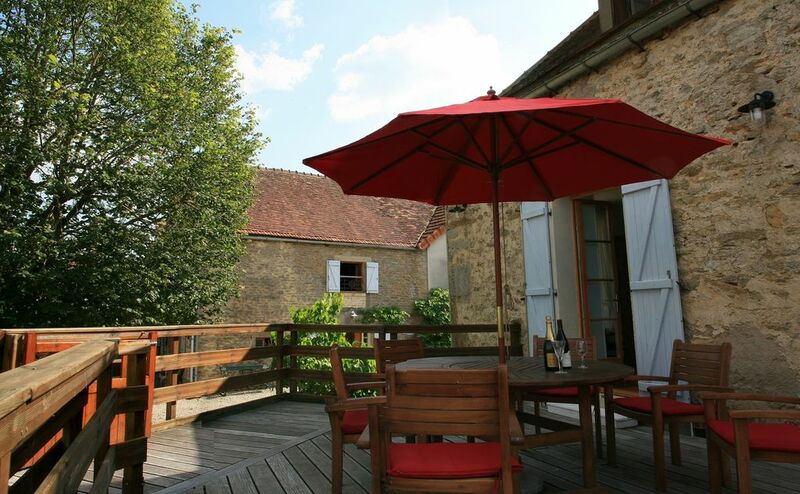 We moved to Burgundy in 2009 and now run a successful property management business, Maison Jardin. We look after a small number of properties, which we let on behalf of the owners, many of whom live abroad. Previously we had both led the busy corporate life, but we came seeking a better quality of life. It's a beautiful part of the world here in Burgundy, and one that we are pleased to call home. We are well and truly settled and enjoy taking an active part in the local community. Ground floor en-suite bathroom (shower & WC) to Bedroom 1, also accessible from hallway/open plan sitting room. First floor bathroom (shower & WC). Duvet cover, bottom sheet and pillow cases. No linen is provided for use with the cots. Ground floor large open plan kitchen/dining/sitting room. The natural stone floors and tall windows create an airy and cool space that is both practical and homely. The sitting area boasts an open fire and comfy sofas. The well equipped kitchen has all mod cons including hob, oven, microwave, and dishwasher. A property that can be highly recommended from various aspects. The two houses are both well planned and exceptionally equipped; really there was nothing lacking. The open kitchen was great for communal cooking and each of our two families had ample space for ourselves. The village is very quiet but not far from shopping and a host of culteral sites. We especially enjoyed biking the area which is simply gorgeous with good, little traveled roads. A perfect get away location for one or two families. Burgundy at its best. Wir waren ab Mitte Juni für zwei Wochen in La Pailotte und schwärmen immer noch von unserem Urlaub. Die Bilder versprechen nicht zu viel, es ist eigentlich noch schöner als auf den Bildern. Das Haus ist wirklich sehr geräumig und wunderschön individuell eingerichtet, von den Schränken, Bildern bis zum Geschirr, lauter kleine Highlights. Die Küche ist sehr gut eingerichtet, alles da was man braucht. Und - sehr wichtig - gute Betten mit sehr komfortablen Matratzen!!!! Die Terasse bietet eine spektakuläre Aussicht, auch vom Pool aus geht der Blick ins Tal. Nachmittags/Abends hatten wir immer Besuch von den Kühen, die auf der Wiese unterhalb des Pools grasten. Wir waren nur zu zweit da und hatten das ganze Gelände für uns, da das zweite Haus nicht extra vermietet wird - Idylle pur. George und Peter haben uns liebevoll und sehr freundlich umsorgt, alle Fragen wurden schnell beantwortet. Man konnte sich einfach nur wohlfühlen. Lovely house with wonderful view from the terrasse. The owners did a great thing restoring the house like this. Everything was well equipped: kitchen, bathrooms, garden furniture...A TV would have been nice too, f.i. when a person gets ill (like I did) it would have been nice to look at a DVD while the others were out of the house. Normaly I don't need a TV in a holiday house, but now it would have been nice. The surroundings are beautiful: lovely and peaceful villages, and a couple of nice towns such as Semur-en-Auxois. The logs for the fire place gave a lot of smoke in the room, probably because they still were a bit damp. But apart from this we had a lovely week! There was a person with us with restricted mobility but he too enjoyed the house very much with the sleeping room and shower room downstairs. There's enough parking space near the house, the swimming pool is lovely (though still very cold this time of the year) and shops are not far off (there's even a supermarket opened on sunday) . The owners were very friendly to let our 2 (little) dogs stay with us in the house. This was wonderful for us, because it's very hard to find places where there are 2 dogs allowed. I would surely recommend this house to friends! Airport: Paris (CDG) 3 hours. Please note that La Paillotte is situated in a rural village, so a car is necessary. Car hire can be arranged at Montbard. The medieval market town of Semur en Auxois is just 5 minutes away by car and offers restaurants, cafes, supermarkets, banks and a hospital. Venarey is also 5 minutes away by car and offers supermarkets and an excellent boulangerie/patisserie. Close by is Alesia with its extensive remains of the earlier Gallo Roman city and a recently opened Eco Museum depicting Vercingetorix, leader of the Gauls and his last battle against Julius Caesar’s Roman army which took place on this site. For wine lovers, Lantilly is located between Chablis to the north and Beaune to the south .You can taste(and buy) any of the famous names of Burgundy wines and visit the vineyards themselves .It is also ideally placed to explore the southern part of the Champagne region as there are 15 champagne houses within an hour’s drive. A new trail, the ‘route du cremant’, takes you through the charming wine villages of North Burgundy with the opportunity to taste many varieties of Cremant de Bourgogne - the champagne of Burgundy , often considered better and certainly half the price of Champagne! Burgundy is also well noted for the warmth of its welcome and the extent of its hospitality. Not overrun with tourists, the region is relatively undiscovered, but Burgundy is proud of its culture and offers wine fairs, gastronomic events and local festivals throughout the year. The oldest horse race in France is “La Bague” which takes place in June on the streets of nearby Semur en Auxois, and this medieval town holds antiques markets and a small fresh produce market on Sunday mornings. Excellent restaurants abound! Booking Notes: Contact Richard & Caroline Williams to make a booking. Changeover Day: Changeover day is normally Saturday, but please contact us, especially out of season. The house is available from 5pm on the day of arrival, and should be vacated by 10am on the day of departure. Notes on prices: Payment is in € (Euros).